I worked on Amy’s birthday present for about a week, using source material from the National Park Service to create a detailed map and checklist of the 58 National Parks administered by the National Park Service. We have said that it is a goal to visit all of the National Parks, and now we have a way to keep track! I tried a few ways to keep track, including a small map with a list of parks that you check off in a separate list below, but I thought it would be more fun if you physically “x” off the parks right where they exist geographically on the map. 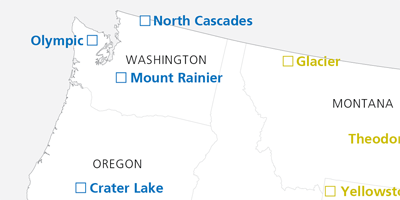 I started with this map that contained small dots at each site, and a simple text label. From there, I removed everything but the 58 actual National Parks, put a checkbox where the dots were, and I color-coordianted the text and boxes to the 9 National Park Regions described in the Passport to your National Parks cancellation book. To finish it off, I added the standard black National Park Header, and an alphabetical list beneath the map which allows you to record when you first visited the park. I had initially designed it to be printed on our 13×19″ capable Canon Pixma Pro 9000 Inkjet, but decided to try Costco, which will print a 20×30 print for just 8.99$. I found reaosnably priced 20×30 frames at Ben Franklin, and I found really convenient adhesive foam core in conveniently enough, 20×30 pieces for 6$ a Michaels. I am really happy with the final result, which looks really classy in the black frame. It served as a great conversation piece during Amy’s birthday party, althought we still need to check-off the 11 parks we have visited together. And, I think she liked it! Funny, I had never heard of a Buddy Bison before. They are entertaining, maybe we should get one. It looks like they are sponsored by the National Park Trust… I wonder how they support and complement the park service itself. Great idea! I was trying to find a map of just the National Parks and not all of the other historical sites, etc. Any chance you can send me a email cop of the map? I have considered making a small print run of these posters and making them available for sale. Is this something people would be willing to purchase? 7 years later, did you ever do that small print run to sell? Tom- I came across your site while googling for a national parks checklist poster. I would definitely purchase a copy of the checklist poster if you made it available. Feel free to contact me by email if you’re still interested in making a print run. Hi…Just happened upon your blog. This checklist is exactly what I’ve been looking for! Did you ever end up printing any copies? I’d love to purchase one. I would definitely purchase one (or two) if you ever end up making a small print run. It’s a fantastic poster. I too would love to purchase one of these from you! Had you ever made the checklist available for sale? I’d be interested. Tom, this is just what I am looking for to track our park visits. Have you made it available yet? Tom, I love it! Exactly what I need! I would definitely be interested in purchasing. Have you decided against selling? Great idea! I would love to buy the file or a print from you! Please let me know! I also buy a patch from every park. It’s a fun way to keep track of which parks I’ve been to as well. 27 down and I’ll cross 3 more off next week! Weird, I just stumbled across your blog as I was looking for a collector’s book to keep all my National Park brochures. I am doing a similar project as you, trying to get to all the National Parks, but I’ve included historic sites, monuments, and others. 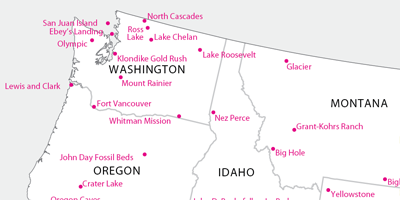 I am using a map put out by the National Park Service that has all the sites laid out and categorized, very easy to check off and keep track of progress. This is great! I too have been looking for this and would purchase if you ever decided to sell copies!! I, too, would like to purchase or print this map. Let me know if you are making it available. I would love to buy one of these! You could make a killing! I would also buy one. WE visit a national park or 2 every summer . I would love to purchase the poster to dispaly our adventures. I would also like to purchase a poster! I love it! I would also like to purchase a poster! I love it!! My husband and I have been to 14 National Parks this year. A poster would make a great present! Are you selling copies? Have you made your “National Park Poster” available to purchase? I’m interested. Great work! Also interested… please, offer this for sale or download!! Hi Tom, I am also very interested in purchasing this poster. I have the same goal of visiting all the National Parks and this is exactly what I am looking for. I would love to purchase this as a high res download so I can send it to a printer and have it printed for my wall. I love the national parks. Any chance you are selling it? I would love to purchase one map also! or maybe 3 (one for each child). we have started our trek to the national parks. We did 5 this summer! 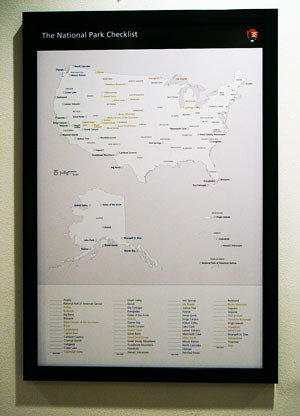 I am wondering if you ever did print the map of the National Parks. We have just retired and are working on finishing up visiting all the national parks that one can get to by driving. Your map would be great to have and to frame when we are done. I think what you created is wonderful and that the National Park Service might be interested in selling it as well. Thank you. I would love to purchase this poster. Please let me know if you will consider selling these. Yes please! Is there any way I could purchase one of your maps for my husband for Christmas? Have you by any chance made an updated one with Pinnacles in california? Great idea! I looked through the comments but never saw if you ended up making this amazing work available. Any chance it is? 🙂 Thank you! please allow us to buy this lovely idea for ourselves! I really hope you have made these for sale! Very interested. Thank you. Tom, I have been looking for something like this to buy. Are you selling any? Hi – I would like to buy at least 2 copies of this for loved ones. Are you selling any or considered an etsy shop?